« Nokia's Comes With Music is everywhere, but is the message getting through? Do you like to rent your music collection or own it outright? 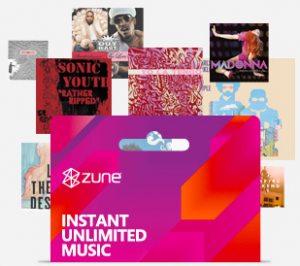 With the updated Zune Pass, Microsoft’s subscription service for its Zune line of portable media players, you can now have the best of both worlds. Sort of. For a monthly fee of $14.99, Zune Pass subscribers get access to millions of tracks on a rental basis — once the subscription ends, access is shuttered — but with today’s changes they can also keep ten DRM-free tracks on a to-own basis to add permanently to their music collections. Microsoft also announced that it will soon offer over 90 per cent of its music as DRM-free MP3s, compatible with almost any music player, including PCs and Macs, iPods, cell phones and game consoles. In other words, music downloaded for keeps via Zune Pass isn’t tied to a Microsoft device. The new hybrid rent to own subscription model is the outcome of agreements signed by Microsoft with major music labels EMI Music, Sony BMG Music Entertainment, Universal Music Group (UMG) and Warner Music Group, as well as independent distributors INgrooves, Independent Online Distribution Alliance and The Orchard. Now call me old skool but I don’t want to keep 10 tracks per month, I want the full album instead, which could be less than 10 tracks or a few more. Otherwise I really like the rent to own concept that gives unlimited access to the complete Zune Marketplace catalog enabling subscribers to discover, sample and enjoy all of the music that’s on offer, and then over time build up their own permanent collection to enjoy on any music device, not just Zunes – forever. Zune users to be paid for sharing songs? I could see this make sense if remaining downloads were rolled over to your next billling period, meaning you get twenty tracks the second month if you don’t download anything the first month. But I guess that won’t be the case? WHEN will Zune’s marketplace show up in the UK–this is ridiculous, My wife bought me a 80GB Zune and was horrified that we can’t use all of its great features here in england. for example, this subcription pass. Unfortunately, the Zune has never been officially released outside of the US. That’s why there is no support for Zune Marketplace in the UK, and may never be.